The picturesque town of Hoi An was an important international trading port from the 16-18th century, connecting Asia and the rest of the world. 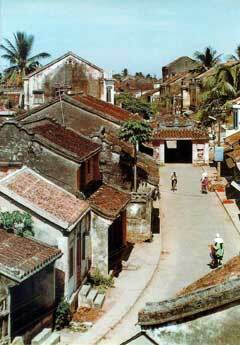 Today Hoi An is a living architectural museum and one of the best-preserved ancient towns in Vietnam. Visitors to this UNESCO World Heritage site can explore the quaint cobblestone streets, excellent handicrafts, and eccentric building styles that mix Portuguese, Chinese, Japanese, and French influences. Tan Ky House: was built around 1800 for a well-to-do Vietnamese merchant. The back of the house which is a short distance from the river bank was used as a storage area for goods unloaded from the merchant ships that visited Hoi An. Wooden panels inlaid with mother of pearl are hung from many of the columns that support the roof of the house. A great deal of care has been taken to preserve this building and it is well worth a visit. Diep Dong Nguyen House: is a former dispensary of Chinese medicine and is about 120 years old. The upstairs section houses the owners private collection of antiques. The original bridge was built in the late 16th century to link the Japanese and Chinese quarters of Hoi An. Each entrance to the bridge features stone carvings, a pair of monkeys on one side and a pair of dogs on the other side. On the north side of the bridge is small Chua Cau temple. The temple was founded in the mid 17th century. A statue of Quan Cong sits in the central altar of this Chinese temple. The statues of General Chau Xuong and Quan Binh sits to the left and right of Quan Cong. Fujian Chinese Hall: was originally used by the local community as a place to hold meetings. Later it became a temple dedicated to Thien Hau. The main hall has several murals depicting Thien Hau and heads of Fujian families who fled from China after the overthrow of the Ming Dynasty. You can also visit the Cantonese Congregation Hall and the Chinese All Community Hall. Further afield is the ancient Champa Kingdom at My Son.